DYK that, per hour, an elite ultra-marathoner can need up 90g of carbohydrates and can sweat up to 2.4L of fluid including 2400mg of salt? Wow, those are some pretty CRAZY nutrition requirements…but why don’t we just start with the basics. Exercise, activity, sport, movement - whatever you want to call it - is super important for your health and well-being. That being said, activity is also a HUGE stressor on your body. Exercise breaks down your muscle protein and red blood cells, uses up your stores of glycogen and pools of antioxidants, and causes you to sweat out fluids and electrolytes. But never fear, in order to quiet some of this stress on your body and improve performance, you can focus on nutrition strategies before, during, and after sport. And don't forget about the importance of rest days, stretching and sleep! Up today is Before Activity. What should you eat before sport? Pre-exercise nutrition is key for fuelling your working muscles for the activity that lies ahead, whether it be endurance, speed, or power. What you eat before activity also fuels your brain to support focus and concentration. To fuel before sport, you want to focus mainly on topping up your muscles’ glycogen (carbohydrate) stores and total body fluid volume. To do this you need to eat carbs and drink fluid, keeping in mind that everyone is different in regards to what they like to eat and what sits comfortably in their stomach. Carbohydrate-rich: containing foods like grains (crackers, pasta, quinoa, oatmeal), starchy vegetables (sweet potatoes, squash, corn), pulses (beans, lentils, chickpeas), fruit, and yogourt, milk or milk alternatives. Moderate in protein and fibre, to help slow down digestion and provide a steady release of glucose into the bloodstream. Low in fat, to avoid stomach upset (high fat foods are extra slow to digest). Last but definitely not least, it should be familiar! It is important to practice your fuelling strategies in training so that you don’t get any surprises on competition day. When should you eat before sport? Aim to eat 1 to 4 hours before activity. The longer you have before exercise, the bigger and more complex your meal or snack can be (complex meaning, higher in fibre, protein, and fat) because you will have more time to digest it and prevent an upset stomach. If you’ve got say 3 to 4 hours before sport, your food choices can be meal-size. But if you’ve only got about 30 minutes to an hour, it’s probably best to stick to something snack-size that is easier to digest. If you’re really short on time, you may even want to try something liquid like a shake or a cup of juice. 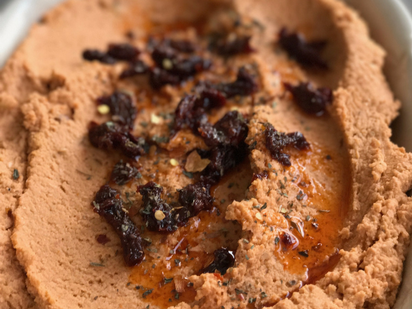 sun-dried tomato hummus - pair with some pita or crackers! Stay tuned – in the coming weeks I will cover what to eat during and after activity!